Bradford's professional, student friendly taxi service. 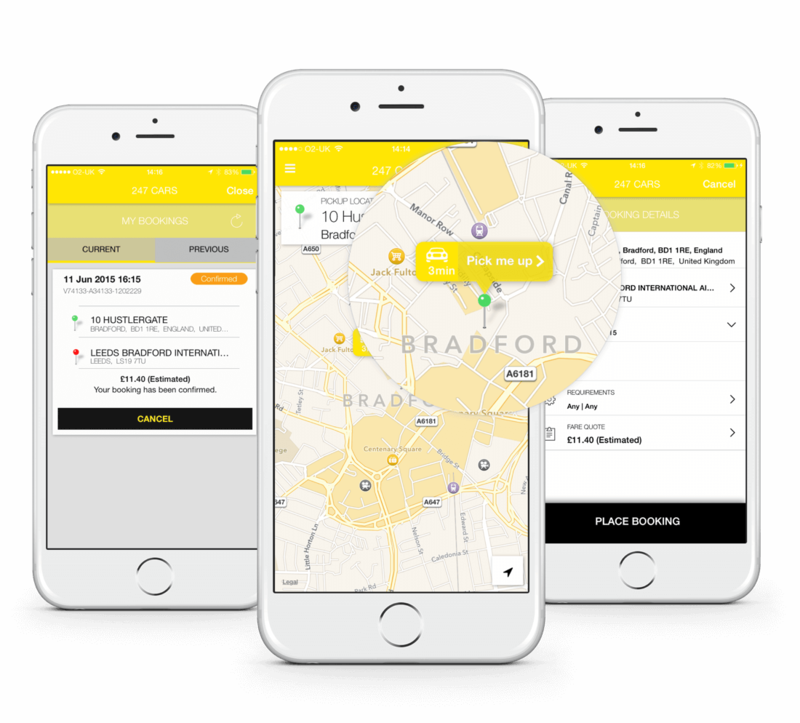 247 Cars have one of the largest taxi fleets in Bradford, with over 100 drivers and the latest technology assisting in a seamless journey for everyone. You can book via our super fast app in seconds or you can call us and make a quick booking. We are the ONLY taxi company in Bradford accepting card payments via our app and we have the latest state of the art dispatch system providing customers with the fastest option every time. We know service and comfort are important factors when choosing a taxi service so we ensure all our cars are kept to a high standard. Our drivers are also given training and local awareness as we keep customers at the forefront of our company aims. We were the first company to introduce these standards and we were the first company to introduce computer booking dispatch giving customers the fastest and most efficient service. We are now the only taxi company in Bradford operating a world class app that takes cash and card bookings. 247 Cars is Bradford's most recommended private hire taxi supplier. We currently provide our services to national supermarket chains and NHS affiliated services. Customers like the aforementioned need a different and variant supply of taxis whether its a minibus, estate, saloon or indeed a more discreet service. We know how important it is to ensure that we are punctual; it is important to us that YOU are on time, whether it is for an important meeting, lunch, catching a train or a flight. We take 100s of Leeds Bradford airport and Manchester airport shuttles a month. All our cars are fitted with flight trackers ensuring we don't turn up early or late for or to your flight. We ensure sufficient time is given for the drop off or pick up. We also have the most competitive rates which allow you to have peace of mind and the comfort of knowing your journey will be the least of your worries and not distract from a well deserved break. Our App now allows you to book with us wherever and whenever you like with the ability to track your car in real time. You will receive push notifications on your BOOKING status keeping you up to date on the progress of your DRIVER. Booking is easy with the option of selecting your map position or simply typing in a street name or postcode. 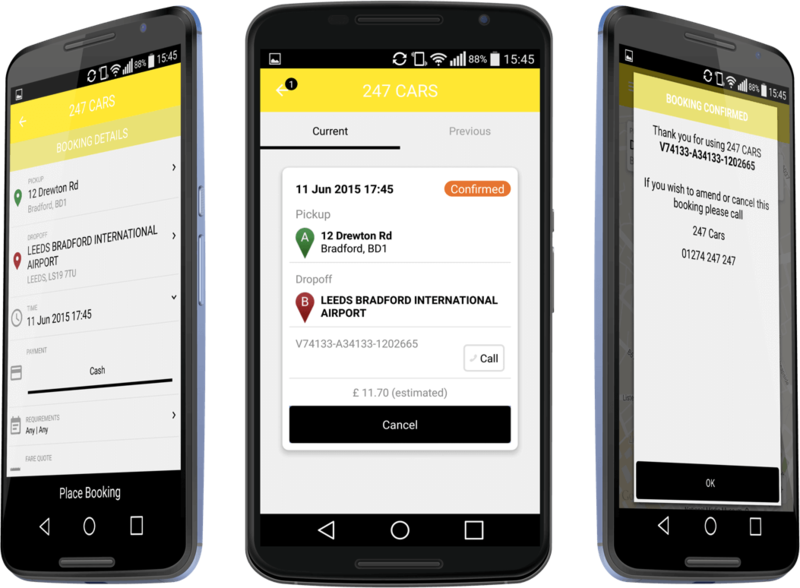 Download our FREE Android and iOS app to book your taxi journey now or plan in advance.